A househusband's work is never done, it seems. As if looking after the children isn't enough, there are the household chores to fit in too. Cleanliness is next to impossible with young children in the house, but every effort has to be made nonetheless. A few simple steps can be taken to make the job more straightforward. For a start, get rid of as much clutter as possible. An uncluttered room with only furniture on the floor is 10 times easier to clean than a room with all manner of paraphernalia scattered about. So have a clearout and be ruthless. Keep items that are used frequently or loved deeply and nothing more. That applies to clothes too. Ask each member of the family to have a clearout and get rid of anything that is never or only rarely worn. Fewer clothes means there is less to be washed, ironed and put away. Of course, huge bundles of clothes will allow a household to survive longer without the laundry being done, but it is not a good idea for a stay-at-home dad to let mountains of laundry build up. When dealing with sterilised bottles and baby food, it is imperative that the kitchen worktops are spotless, and the less cluttered a worktop is, the easier it is to clean. The task is far easier without having to clean under coffee makers or around food processors, so unless an item is used on a regular basis, pack it away. Stay-at-home dads should learn to clean up after themselves as a matter of course and pounce on any opportunity available to keep the house tidy. Rather than let dishes pile up in the sink, wash them straight away. 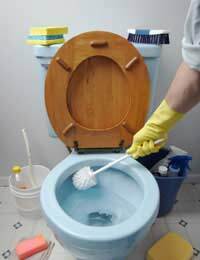 Clean up while cooking to prevent being left with a messy kitchen, and while running a bath use the time to give the bathroom sink or toilet a quick scrub. If the baby is happily sitting in a high chair eating toast, rather than standing watching, a househusband should be washing bottles and dishes or sweeping the kitchen floor. When the baby is content playing with toys in the front room, take the opportunity to dust or vacuum. Get into a routine with the laundry. Put a load in to wash in the morning so that it has time to dry during the day - whether hung inside, outside or put in a tumble dryer - and don't let the pile or ironing get too big. Blanket boxes or big baskets are handy to hide toys away and make clearing up quick and easy once the child has gone to bed. This will allow some quiet time with a clean house at the end of the day and means the house starts out clean and tidy the following day. It won't stay that way for long, of course. Get used to the idea that messes will be made throughout the day. Nothing will stay clean for very long, but by keeping on top of the mess a househusband can make the household chores a manageable task. Remember that these chores should never deflect a dad from his main role of child carer. By cleaning up after himself rather than letting the jobs pile up, a househusband can find more time for fun activities with his children and make the whole stay-at-home experience a much more pleasurable one.